Bubble Eye Goldfish - Small, 1.5" Long - Rs.68.51 [18-10A-002] - MakeMyHobby.com Reviews!, Aquarium FISH & PLANTS online, delivery available all India. The goldfish of today are descendants of a species of wild carp known as the Prussian Carp, Silver Prussian carp, or Gibel Carp Carassius gibelio (syn: Carassius auratus gibelio). These wild carp originated in Central Asia (Siberia). They inhabit the slow moving and stagnant waters of rivers,mmh lakes, ponds, and ditches, feeding on plants, detritus, small crustaceans, and insects. The Bubble Eye Goldfish, also known as the Water-Bubble Eye Goldfish, was developed in China. It is one of the more than 125 captive bred fancy goldfish varieties. The Water-Bubble Eye Goldfish, also called the Bubble Eye Goldfish, is an egg-shaped variety of goldfish. It has a double-tail, and its body shape and size are very similar to the Celestial Goldfish, which is also a bit slimmer than other egg-shaped goldfish. Also, like the Celestial, its eyes are upturned, though not as extremely. Fluid-filled sacks begin to develop as bubbles under its eyes at an age of 6-9 months. By the time they are 2 years old, the bubbles are very large. It is one of the dorsal-less goldfish, though one variety bred in China does have a dorsal fin. These goldfish are available in a variety of colors that include solids of red, blue, chocolate, and black; bi-colors of red/white and red/black; and calicos. They will generally reach about 5 inches (13 cm), though some hobbyists report their Bubble Eye's growing much larger. The average goldfish lifespan is 10 – 15 years, though living 20 years or more is not uncommon in well-maintained goldfish aquariums and ponds. Size of fish - inches: 5.0 inches (12.70 cm) - Although this fish is capable of larger sizes, it rarely exceeds five inches in the home aquarium. Lifespan: 15 years - The average goldfish lifespan is 10 – 15 years, but they have been known to live 20 years of more when well maintained. Bubble Eye Goldfish are among the more delicate species of goldfish. They are not recommended as a beginner fish or for community aquariums. Unlike the flat-bodied types of goldfish, they have a lower tolerance for pollution. They will need good care and plenty of space. When it comes to feeding, they will not thrive with fast, competitive tank mates. Be careful when netting these fish as their eyes are easily damaged. Also, be careful of filter intakes. If there is a strong water flow, the bubble sacs of these fish can get sucked into the intake and burst. Adding some soft sponge filter media over the intake valve can help. Many people will keep goldfish in small one or two gallon bowls with no heater or filtration. But for the best success in keeping the Bubble Eye Goldfish, provide them the same filtration, especially biological filtration, that other aquarium residents enjoy. Aquarium Hardiness: Moderately Difficult - The sacs below the eyes are very delicate. This fish has poor eyesight and is a poor swimmer. Aquarist Experience Level: Intermediate - The aquarist should be well acquainted with Goldfish care and the specific requirements of the variation. Since they are omnivorous, the Bubble Eyemakemyhobby Goldfish will generally eat all kinds of fresh, frozen, and flake foods. To keep a good balance, give them a high quality flake food everyday. To care for your Bubble Eye Goldfish, feed brine shrimp (either live or frozen), blood worms, Daphnia, or tubifex worms as a treat. Feeze-dried foods are usually preferably to live foods to avoid parasites and bacterial infections. Due to the fluid-filled sacs under their eyes, the Bubble Eye can have poor vision. This makes it harder for them to see their food and means they need extra time to feed. Flake Food: Yes - This fish should optimally be fed sinking food as it seems very prone to air ingestion, which can cause health issues for the fish. Feeding Frequency: Several feedings per day - Other Goldfish without sight and swimming handicaps will out-compete this fish at feeding time. These goldfish need a well maintained tank to stay healthy. Minimum tank size is 10 gallons, so make sure water changes are frequent. Regular weekly water changes of 1/4 to 1/3 are strongly recommended to keep these fish healthy. Snails can be added as they reduce the algae in the tank, helping to keep it clean. Setting up a goldfish aquarium in a manner makemyhobbythat will keep your fish happy and healthy is the first step to success. The shape and size of the aquarium is important and depends upon the number of goldfish you are going to keep. These fish need a lot of oxygen and produce a lot of waste. Good filtration, especially biological filtration, is very helpful in maintaining the water quality of the aquarium. A filtration system will remove much of the detritus, excess foods, and waste, which keeps the tank clean and maintains the general health of the goldfish. However, the sacs of the Bubble Eye Goldfish are notorious for getting caught in the water uptake valves of aquarium filters. A foam cover over the valve will help to prevent this. Goldfish are a cold water fish and will do best at temperatures between 65 - 72° F (18°- 22° C). Unlike the flat-bodied types of goldfish, Bubble Eye Goldfish cannot tolerate temperatures much below 60° F (16° C). Provide a gravel substrate to help create a natural and comfortable environment for your fish. You could add some decor but keep in mind that its fluid filled eye sacs can be a problem, both easily damaged and giving these fish poor vision. Make sure that all ornamentation is smooth with no protruding points or sharp edges. Smooth rocks or driftwood, should be used sparingly if at all. Aquarium plants would be the best choice of aquarium decor for goldfish, but unfortunately these fish are diggers. Consequently live plants may be uprooted. Artificial plants make a good substitute and silk plants are safer than plastic ones. Most aquariums come with a cover that includes lighting. A cover for the tank is desirable as it reduces evaporation and though they are not prone to jumping, on occasion some gold fish will jump out. Lighting is not essential for goldfish in general, but it can help the Bubble Eye as these fish have such poor eyesight. It does makes the aquarium a nice show piece and is needed if you have live plants. Lighting Needs: Moderate - normal lighting - Strong lighting will help this fish make the best of what little eyesight it has. Temperature: 65.0 to 72.0° F (18.3 to 22.2° C) - Unlike the flat-bodied types of goldfish, Bubble Eye Goldfish cannot tolerate temperatures much below 60° F (16° C). Breeding Temperature: - In the wild,mmh goldfish spawn in the spring when water temperatures reach about 68° F (20° C). Water Movement: Weak - This fish needs a gentle water flow. Its rounded body and lack of a stabilizing dorsal fin encumber its swimming. Water Region: All - This fish will usually favor the surface or the bottom of the aquarium. Goldfish are very social animals and great community fish, and they are great scavengers as well. It is really not necessary to add other scavengers or other bottom feeders to the aquarium when you have goldfish. 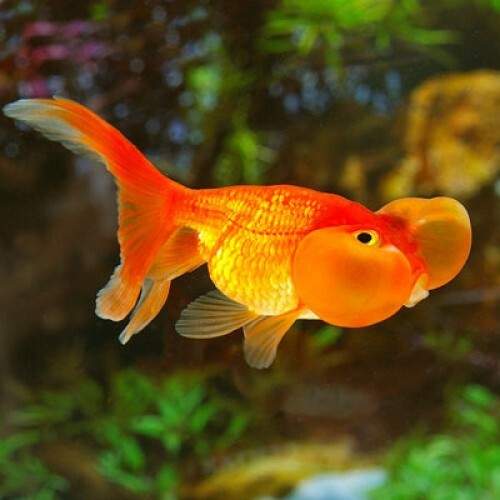 When choosing tank mates for this fancy goldfish, keep in mind the physical traits of the Bubble Eye. Like the Telescope Goldfish and Celestial Goldfish, the Bubble Eye can be visually handicapped. Additionally, its swimming ability is encumbered by its rounded body and the lack of a stabilizing dorsal fin, a trait that is also seen in the Lionhead Goldfish. While the Bubble Eye cannot readily compete for food with fast swimming types of goldfish, any of the similarly handicapped varieties can make good companions. They also do well with their own kind. Bubble Eye Goldfish are egg layers that spawn readily in the right conditions. They can be bred in groups as small as five individuals, but they are very social animals and likely to breed in larger groups as well. The only time Goldfish will spawn in the wild is when spring arrives. To spawn them in the aquarium, you will need to mimic the conditions found in nature. When treating individuals, it is usually best to move the afflicted fish into amakemyhobby separate tank with no gravel or plants and do regular partial water changes. However, if the disease is apparent throughout the main tank, it may be best to do the treatments there. Whether treating in a hospital tank or your main tank, read and follow the manufacturer's instructions for any medication. Some medications can adversely affect the water quality by destroying beneficial bacteria. You may also need to remove the carbon from the filtration system, as carbon will absorb many medications, making the treatment ineffective. Care Level: EasyTemperament: PeacefulMinimum Pond Size: 180 gallonsWater Conditions: 36-90° F, KH 2-.. The Black Moor Goldfish is one of the more rounded or egg-shaped fancy goldfish. This rounded shape .. The Aquafin Spirulina flake fish food is ideal for all Gourami and other vegetarian fish. Basicall..